One day long, long ago there lived a mighty king named Ambarisha. 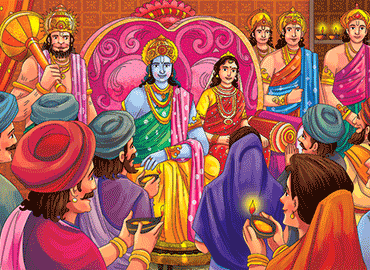 He was strong and powerful and he, and his beautiful Queen Shrimathi, were devoted to truth and justice. Their subjects loved them, and all were happy under their wise rule. Their palace was large and beautifully decorated. It had lattice windows, and balconies, which overlooked pleasant gardens with fruit trees, where colourful songbirds sang day and night. The palace walls were hung with fine tapestries depicting scenes of the Gods and Goddesses in Heaven. The Mahabharata is one of the greatest stories ever told. It is a sweeping tale of love and war, of timeless wisdom and cowardly betrayal. It tells of two groups of warring cousins, both descended from the ancient Royal House of Kuru. These cousins were known as the Kauravas and the Pandavas, and they were rivals for the throne. The five Pandava brothers held to the path of Righteousness, but the hundred Kauravas, led by the evil Prince Duryodhana, used tricks and deceit to get their way. Many wonderful tales of the Gods and Goddesses – Ganesha, Lakshmi, and Krishna - are told during Diwali. We are going to tell you one of our favourite stories.